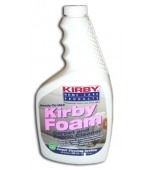 Genuine Kirby Foam - carpet and fabric cleaner. Deep cleanes and leaves no residue. Great for soiled carpeted stairways, car seats, mats, upholstery and other washable fabrics.